Do You Need Physical Music Releases? If CD sales are slumping and digital music sales are on the rise, does it mean you should forget CDs and physical distribution completely and go for a completely digital release? Well...that depends. There are pros and cons to embracing music downloading as the only avenue for your release. 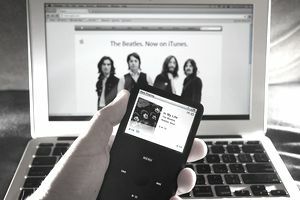 Consider the following upsides and downsides to digital releases and digital music distribution before you decide if the net is the way forward for you. It keeps the costs down. When you release an album online, you don't have to pay for pressing or artwork printing, which makes up the bulk of the costs associated with releasing a record (after the recording, of course). All you need for a digital release is a website set up that is able to handle the download demands for your album. You don't have to share so much of the pie. When you sell your album online, you don't have to share the profits with a physical distributor and a store. At most, you will have to share a small percentage with an online music distributor, if you are not selling the album via your own website, but the cut you have to funnel to them will almost always be less than paying a physical distributor and a brick and mortar shop. You can keep prices friendly. One common complaint cited by music fans about CDs is that the prices are sky high. Because you don't have to share so much of the earnings and because you don't have to consult with a distributor/shop to set the prices, you can make your album price buyer friendly. It's fast and easy. When you release a physical album, you have to deal with designers (who are always late), manufacturers (who are always late), distributors (who always seem to want to push back your release date for one reason or another) and so on. You need a long lead time to make sure everything falls into place the way you want it to, and a lot of patience to deal with things when they invariably don't. With a digital album, releasing the tracks can be as easy and fast as point and click. Promotion is a nightmare. Some of the larger music publications still show some resistance to covering online only online-onlyor a new artist in particular. Yes, a band like Radiohead can drum up a lot of press coverage when they release an album online, but they already have a lot of cache in the bank. Finding a good web promotion company can be tough, and promoting something on the net is hard work. Competition is thick. "Competition is fierce" is the cliche, but competition is thick is a better way of describing what is out there on the internet. How the net bears up under the strain of the glut of bad music it contains is a mystery, but even if you have the best songs in the world, you still have to get people to find you among the hundreds of thousands of websites hosted by people whose HTML is better than their songwriting. There are less people working to sell your music. When you have physical distribution, you have people actively working to sell your music to shops, who actively work to sell your music to people. This is all in addition to any press and radio you might have going. On the net, you're flying blind. Get Your Own Website. You need more than MySpace. Yes, MySpace can be a valuable tool for bands to get their music to the world without needing a record deal or an expensive publicist. Yes, there are great bands on MySpace. But, good luck finding these bands as you wade through the stack of every person on earth who has ever had an internet connection, a guitar, and a dream. Sure, MySpace can be a great thing and sure, it could be the very thing that makes the difference for you. To count on it alone would be folly. Even the world's worst bands seem to get thousands of listens on MySpace and rack up thousands of "friends" which speaks volumes about the quality control. Just so we're clear—yes, be on MySpace if you want. Just don't ONLY be on MySpace (and no, this doesn't mean diversify by adding a Facebook page or getting on Twitter). Get your own website and make a point of trying to get other people to write about it online—reviews in online magazines, blogs, and so on. You don't need a new MySpace page every time you change your shirt. Related to the first point, MySpace has seemed to foster the creation of "side projects." Here's the thing—every time you and your drummer come up with a tune when the rest of the band is out making a cup of tea, it is not a side project. You needn't start a new MySpace page every time you talk music with someone or discuss plans for starting a new band. When you do this, you're only competing with yourself. Cast your net wide (no pun intended). In addition to using your own website, get your album up on as many online distribution sites as possible. Most of these internet based distributors offer non-exclusive deals, so be present and accounted for on as many as you can. eMusic is a great net based distributor for indies, as is CD Baby.